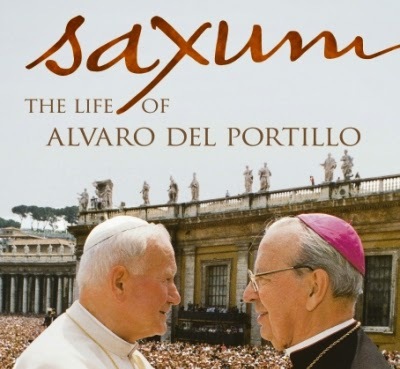 I am currently reading up on the life of Don Alvaro del Portillo via the book entitled, "Saxum". Saxum—the Latin word means rock—is the nickname that St. Josemaria Escriva, founder of Opus Dei, bestowed on Alvaro del Portillo. Don Alvaro, as he came to be known, was for many years the founder’s closest associate as well as his successor and first Prelate of Opus Dei after it became a personal prelature—a foundational rock for this dynamic international Catholic group devoted to promoting sanctity in ordinary life. Written in anticipation of Bishop del Portillo’s September 2014 beatification—his official recognition by the Church as “blessed” and a stage on the way to his possible canonization as a saint—the book is a fact-filled biography set against the background of historic events like the Spanish Civil War and Vatican Council II. It depicts a person of powerful integrity and conviction who set aside a promising engineering career to follow the vision embodied in Opus Dei. Don Alvaro emerges in these pages as a tower of strength, reliability, and good humor in the face of a host of threats and challenges that might well have defeated a lesser man. John Coverdale, an attorney and historian, is the author of two other books detailing the early days of Opus Dei—Uncommon Faith, about St. Josemaria and his companions during and shortly after the civil war in Spain, and Putting Down Roots, about Father Joseph Muzquiz, along with Alvaro del Portillo one of Opus Dei’s first priests, who played a key role in introducing it in the United States. I hope you can grab a copy of this book as well.